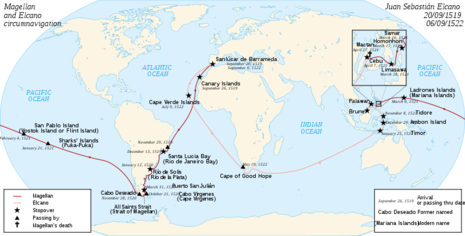 As Brazil was Portuguese territory, Magellan avoided it and on December 13 anchored near present-day Rio de Janeiro. There the crew was resupplied, but bad conditions caused them to delay. Afterwards, they continued to sail south along South America's east coast, looking for the strait that Magellan believed would lead to the Spice Islands. The fleet reached Río de la Plata on January 10, 1520. Thence he made his course to fetch the Cape Verde islands, and they passed between the islands and the Cape without sighting either the one or the other. Having got as far as this neighborhood, he shaped his course so as to make for Brazil, and as soon as they sighted the other coast of Brazil, he steered to the southeast along the coast as far as Cabo-frio, which is in twenty-three degrees south latitude; and from this cape he steered to the west, a matter of thirty leagues, to make the Rio de Janeiro, which is in the same latitude as Cabo-frio, and they entered the said Rio on the day of St. Lucy, which was the 13th December, in which place they took in wood, and they remained there until the first octave of Christmas, which was the 26th of December of the same year. They sailed from this Rio de Janeiro on the 26th December, and navigated along the coast to make the Cape of St. Mary, which is in thirty-four degrees and two-thirds; as soon as they sighted it, they made their course west-northwest, thinking they would find a passage for their voyage, and they found that they had got into a great river of fresh water, to which they gave the name of river of St. Christopher, and it is in thirty-four degrees, and they remained in it till the 2nd of February, 1520. He sailed from this river of St. Christopher on the 2nd of the said month of February; they navigated along the said coast, and further on to the south they discovered a point which is in the same river more to the south, to which they gave the name of Point St. Antony; it is in thirty-six degrees, hence they ran to the south-west, a matter of twenty-five leagues, and made another cape which they named Cape St. Apelonia, which is in thirty-six degrees; thence they navigated to the west-south-west to some shoals, which they named Shoals of the Currents, which are in thirty-nine degrees; and thence they navigated out to sea, and lost sight of land for a matter of two or three days, when they again made for the land, and they came to a bay, which they entered, and ran within it the whole day, thinking that there was an outlet for Maluco, and when night came they found that it was quite closed up, and in the same night they again stood out by the way which they had come in. This bay is in forty-four degrees; they named it the island of St. Matthew. They navigated from this island of St. Matthew along the coast until they reached another bay, where they caught many sea-wolves and birds; to this they gave the name of "Bay of Labors;" it is in thirty-seven degrees; here they were near losing the flag-ship in a storm. Thence they navigated along the said coast, and arrived on the last day of March of the year 1520 at the Port of St. Julian, which is in forty-nine and one-third degrees, and here they wintered, and found the day a little more or less than seven hours. The fleet sailed across the Atlantic Ocean to South America. The ships followed the South American coast. They landed on the bay where Rio de Janeiro now stands. They remained there for two weeks and then sailed south to find a passage to the Pacific Ocean. However, they could not find the passage before the end of summer in the southern hemisphere. After three long months of sea travel, Magellan anchored near present day Rio de Janeiro. The ships were restocked and the crew traded with the friendly natives, but the rest was short-lived. Cautious because of being in Portuguese waters, Magellan quickly resumed the voyage on a path towards the Great South Sea of the Orient. Magellan believed he had found the Spice Islands and exclaimed, "Montevideo," that is, "I see a mountain"; but it was only the large delta of the Rio de la Plata. Disappointed, the crew sailed on.